A few years ago, the New York Times published Jim Lahey's No-Knead Bread recipe and it caused quite a ruckus in the food world--especially amongst home and hobbyist cooks. Why? With Jim's unique recipe, home cook's could turn-out authentic artisinal breads with very little work in their home kitchens that rival those made at a professional bakery. The recipe is incredibly easy and generously forgiving, which what is so appealing about it. Unfortunately, it does require a lot of forethought because you trade the hard work of kneading for 18 hours of fermenting time. 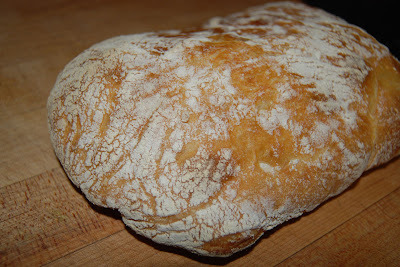 For my birthday, my wife bought me Jim's new book, My Bread, and last night, I made my first loaf of Jim's ciabatta. Honestly, it tasted FANTASTIC--as good as any I've ever purchased. And other than time, it took nearly no work! The recipe requires no kneading. Instead, you stir-together a loose mass of flour, water, salt, and a tiny bit of yeast and let it sit for up to 18 hours. During that length of time, the gluten forms on its own, rather than beating it into submission. The long ferment also lets the yeast work slower and develop lots of flavor. The concept is similar to making bread with a "sponge starter" or the way you'd make a traditional sourdough, except you aren't making just the starter. You're making the entire loaf. The abnormally high water to flour ratio makes a soft, sticky dough that releases its water in the oven as steam. The steam circulates back onto the bread and creates that thick, dark, extra-crispy crust that makes artisan bread so appealing. You cook it in a big heavy pot. This method, combined with the high water content, perfectly replicates commercial steam-injection brick ovens found in professional bakeries. I love making bread. It's such a comforting activity and one that really makes me feel as if I've gotten back to basics. Modern supermarket bread is really an example of how even the most simple, basic foods in our diet have gotten away from their roots. Do you ever make your own bread? What's your favorite kind? Do you use a breadmaking machine or do it old-school? I've been eager to try a similar recipe (http://bit.ly/7PCNw) and ordered a booklet from Fleischmann's with a few more. I'll let you know how they come out once I try them... maybe this weekend.